Challenge tests business skills, measures profitability of corn and soybean crop. Kurtis Peeters, an organic corn grower from Kawartha Lakes and producer for Organic Meadow Co-op is the winner of the Most Profitable Acre Challenge, a competition organized by the Agri-food Management Institute and presented in partnership with Grain Farmers of Ontario. The business skills competition looks at input costs, production practices, yield, marketing tactics, and business management practices to determine the farmer with the most profitable acre harvested in corn or soybean production in Ontario. 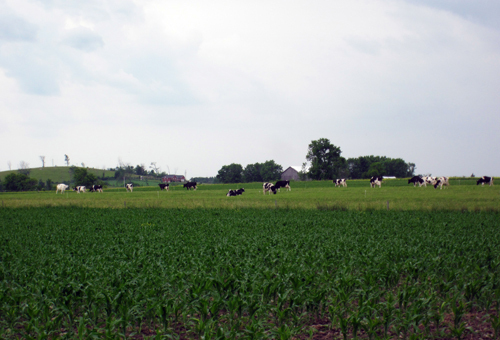 The corn and cows of Kurtis Peeters’ farm Helling Holsteins. Image courtesy of Organic Meadow Co-op. Mathieu Lauzon, an organic soybean grower from North Glengarry placed second in the Most Profitable Acre Challenge , and Jim Denys, an IP soybean grower from Huron County placed third. Nineteen farmers entered the competition.